Tucker asked to take Toy Review Tuesday ’cause it’s alliterative and he’s terrific like that. Today’s tale is about the most tremendous, tantalizing toy ever. It is, by turns, terrible, traditional, trivial and taxing. It can tee off a train of truly tumultuous trips. Its tincture is familiar to everyone but tempting to only a few. It’s track record is a telltale sign of its trustworthiness. Put quite simply, there is no other toy that elicits so much excitement. Period. The tennis ball is It. If Tucker were stranded on desert island and could only take one toy, he’d take his tennis ball (but wonders if maybe a BAG of tennis balls would count as one toy). What is it about the tennis ball that sets dogs a-drooling. Well, for Tucker, it’s bonding time. Tucker LOVES to have someone lay on the floor with him (while they’re watching TV or something else but he’d prefer they focus all their attention on him) and will chase the ball as often as anyone will throw it. He’s very good at chasing after the ball and very good at bringing it back. When he’s told to “Give!” he hikes his nose up in the air and throws it at you. And if you don’t throw it quickly enough he’ll nudge it ’til you do. This is all, of course, assuming Barclay and Oliver have been given strong sedatives or finally gone to Some Other Home where they belong (says Tucker). 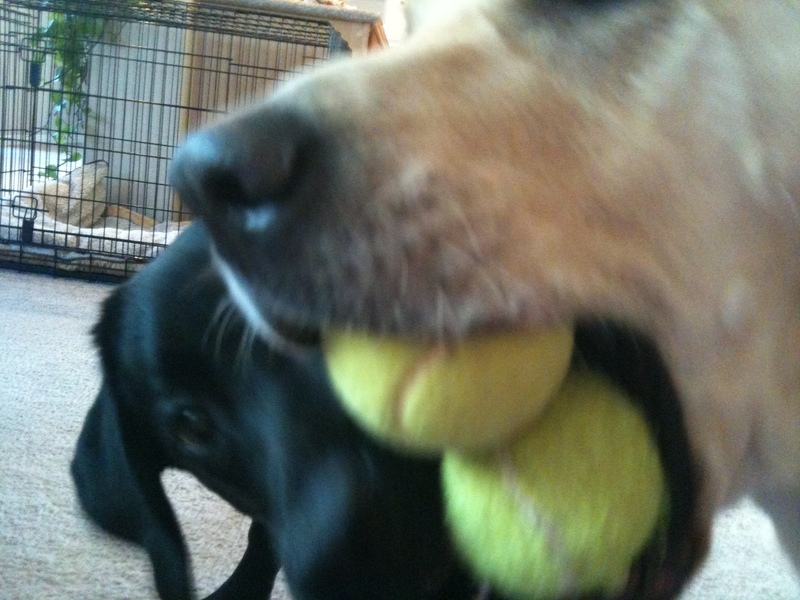 Tennis balls can go ANYWHERE – they’re easy to transport, they fit in a lab’s mouth perfectly, they bounce, they roll, they’re fuzzy, they’re just, well, THE PERFECT TOY. Period. And they float!! And they’re a great way to meet new friends! 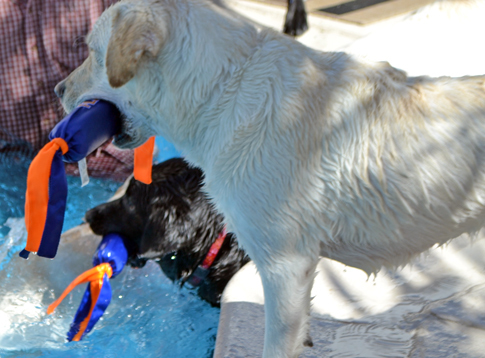 We had a trainer once who told us “A dog should only have one, maybe two, toys.” Truly it makes sense — it teaches the dog to focus, they assign value to THAT toy, etc. etc. etc. blah blah blah. But then there’s also the philosophy, “He Who Dies with the Most Toys WINS!” The Buck-White Boys ascribe to that. And while death isn’t imminent, WE. ARE. WINNING! So this is the first in our weekly series – Toy Review Tuesday – where we discuss the best toys. Best means they can stand up to labs, heavy chewing and frequent use. They have to be interesting (squeakers, rattle, crunchy, etc. ), humorous (for the humans) and, above all, FUN. 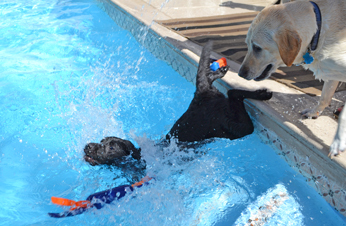 This week’s toy is the penultimate toy, ’cause it’s the one that got Barclay in the pool. 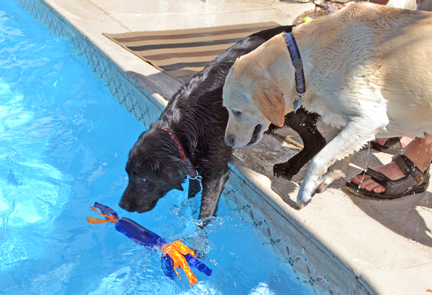 The Buck-White Boys are proud to endorse and recommend —- the Flappy Dog Toy! There’s a bunch of varieties and you can check them out at www.flappydogtoys.com. 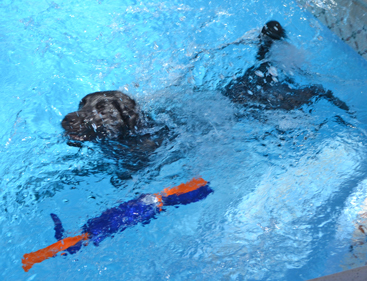 Our favorite is the Floaty Flappy. 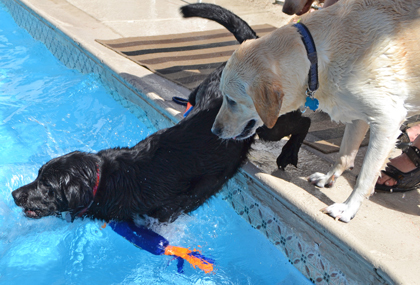 Barclay has always been a little stand-offish of the water — he’d much rather chase everyone around the pool and steal their toys from them when they’re trying to get out: Barclay Steals Toys. Then Barclay discovered the Flappy Toy and who knows what clicked in his little lab brain, but that was the toy he had to have. But it was in the water. With Aunt Denise. Flappy Toy + Aunt Denise was too much to resist aaaaand . . .
And then he was all, “Aunt Denise who?! ?” Couldn’t keep the B-man out of the water and ever since then, as long as Flappy Toy is around, Barcle Bunny Foo Foo is a Water Dog. 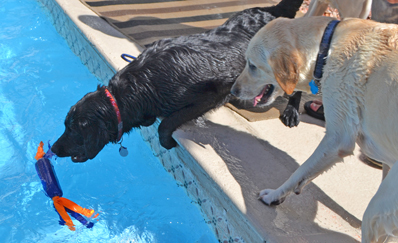 The Buck-White Boys give the Flappy Toy a hearty A+ and think its a must-have for all homes with Labs. Which should be all homes.